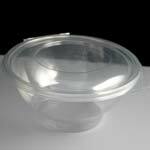 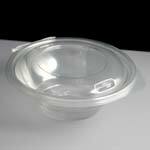 We offer a range of plastic hinged salad bowls, from 250cc up to 1000cc in capacity. 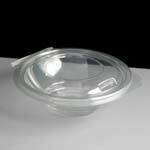 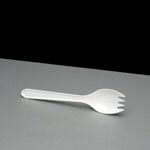 They can be easily made tamper resistant by placing a label over the front tab, the bowl will then not be able to open with out the label being removed. These Anson plastic salad bowls are clear for excellent food presentation and can be stacked on top of each other for fridge and shelf space utilisation. 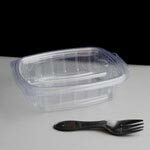 We also stock a range of rectangular hinged salad containers in sizes from 250cc to 2000cc, click to view these products and prices. 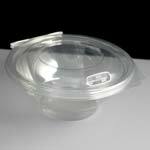 We also stock a range of circular salad bowls and lids with the unique sauce pot storage system, Press and Dress click to view these products and prices.